It’s not very often that I feel like I need to preface a concert review by first reviewing the venue, but this is an exception. Ravinia is the oldest outdoor concert venue in the United States, and a very unique environment. Nestled within a forest in a suburb of Chicago, the venue invites fans to bring coolers and wagons filled with full meals, wine, cheese, tables, candles, cutlery, and what have you. Although it is a beautiful and well kept venue, the fact that I see people eating quiche by candlelight at a rock concert does disturb me a bit. The huge lawn area where all this takes place slopes downward and away from the pavilion seats that look toward the stage, too. So, not only are folks dining finely on the lawn during the concert, but they can’t even see the stage. It just doesn’t sit right with me. When a venue sells a full set of dishes right next to the band t-shirts, my rock and roll nerve twinges. But, this is the crowd that Ian Anderson was faced with as he came out of the shadows to start the Jethro Tull classic, Thick As A Brick. As his band polished cymbals and swept the floor dressed as a custodial crew with the house lights on, the crowd didn’t even realize what was going on on the stage. It wasn’t until the screen in back sprung to life and the lights went down that this crowd was ready to go. As Anderson appeared stage left with a single spotlight behind him, he squeaked out the opening lines of Thick As A Brick. My initial thought upon hearing his voice was that it had gotten higher over the years. As the show progressed, his voice seemed to gain the lower register and it even got a bit stronger. It was immediately apparent that Anderson would call upon a young singer for help with much of the material, though. Ryan O’Donnell is a 31-year old actor/singer who shadowed Anderson for much of the show, interacting and singing with him with great success. As they trade verses on much of the material, it frees up Anderson to concentrate almost entirely on his flute and guitar playing, while also adding another dimension to the music. The only part of the concert that still sits a bit funny with me came in the very beginning. As the spotlight hit Anderson and he started the opening lines of the classic Thick As A Brick, we saw him playing the guitar part of the song. As I heard the famous flute part of the song, I looked to see where it might be coming from. I thought, perhaps, that keyboard player John O’Hara may have been playing it on keys, but he was away from the ivories. 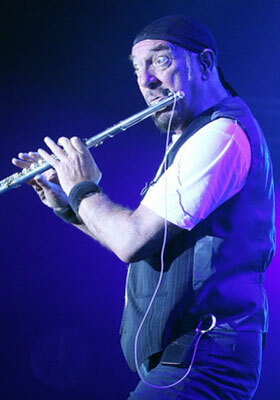 It seems that the flute was on a backing track which, for being an Ian Anderson concert, was a strange irony. Once he made his way over to the silver pipe he was relentless though, hardly putting it down for the entire performance. For a man about to turn 66 years of age, his stamina is really quite impressive. Although his voice never fully reached the heights of days gone by, his stage antics and energy were in full force. Anderson could be found shuffling quickly around the stage or in his signature one-legged stance throughout the duration of the show. I got tired just watching him. Anderson is a man that goes through life with eyes and ears wide open. His awareness of religion, politics, and the “flavor of the day” current affair issues usually come through in the music. But tonight, Anderson took a brief but awkward moment to give the audience a public service announcement for prostate cancer. Anderson is quite the philanthropist, supporting many different charitable organizations over the years, and this was his way of caring about the attentive older crowd. He concluded his rant in well under a minute and asked us to remember a few friends that had passed. This ushered in images of Frank Zappa, Johnny Ramone and others on the screen, which made for a pleasant and heartwarming moment. Arguably, Thick As A Brick is Tull’s most progressive album. It’s all one song, with many movements and complex composition. The level of musicianship to pull this material off needs to be of the highest caliber, and Anderson brought a band with him that could match his musical prowess as well as his physical intensity. In particular, the drums on Thick as A Brick have always excited me, and drummer Scott Hammond would execute the complex rhythms and solos of the original masterpiece perfectly. The other standout performance came from guitarist Florian Opahle. Cloaked with a sunburst Les Paul that he turned into a weapon of mass musicianship, Opahle tore through every note with confidence and passion. As the band took a 20 minute intermission before going into Thick As A Brick 2, I found myself hopeful. I liked Anderson’s 2012 second offering of the Thick As A Brick saga, but I wasn’t sure how it would stand up being played back-to-back with the original classic album, which has always been a favorite of mine. It turns out that the band attached itself to Thick As A Brick 2, and stitched it together with the original with seamless precision. Many times throughout the performance of Thick As A Brick 2, I was reminded of certain passages from the original. It was a powerful performance by the entire band. The band exited the stage to massive applause, and re-entered with even more. The band was to play one song that was not on either of the Thick As A Brick releases, and it was the hard rocking “Locomotive Breath.” As I watched Ian Anderson pace from one end of the stage to the other, still blowing out flute passages that just blew my mind, I thought of every person that has ever called the flute a “girl’s instrument.” Nobody plays the flute like Ian Anderson, and never have I seen so much passion and muscle come out of a woodwind. Everyone should see Anderson play flute at least once, just so they can witness the unimaginable force of that instrument. Kudos to Ian Anderson for taking Thick As A Brick and Thick As A Brick 2 to the stage, while leaving more popular songs like “Aqualung” and “Bungle In The Jungle” for a different day. It’s a bold and courageous move that shows what confidence he has in the Thick As A Brick material. The gamble paid off as I was thoroughly satisfied with hearing one of the greatest rock concepts of all time.